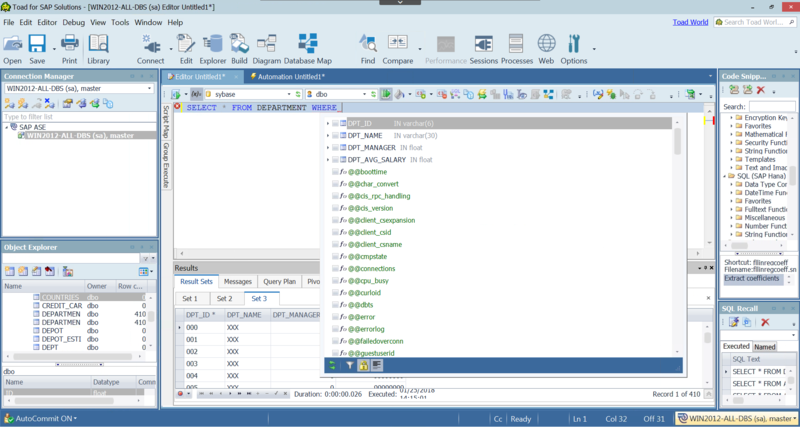 Build SQL with minimal keystrokes, or use the visual query builder and never touch your keyboard. 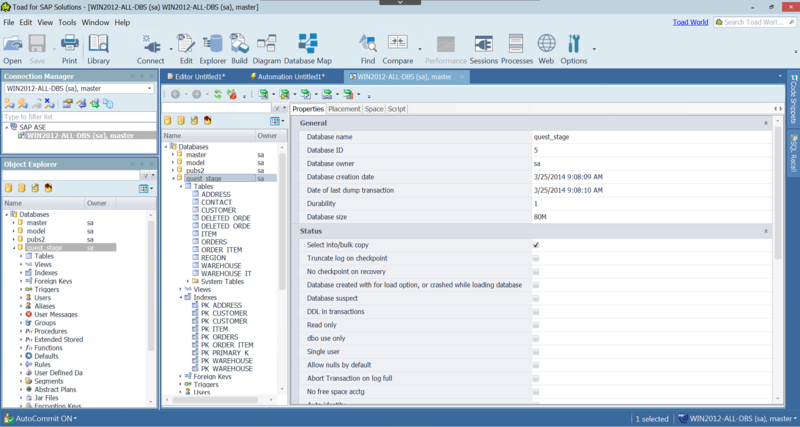 Generate queries and reports and perform SQL development and optimization faster. Automate and schedule frequent and repetitive tasks. 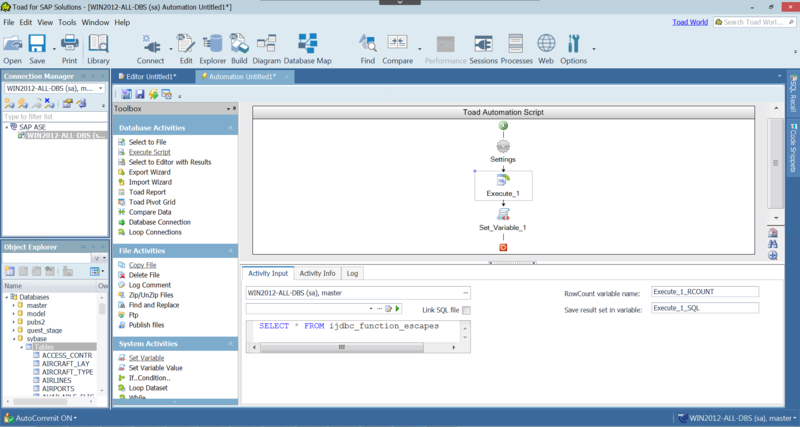 Create and manipulate database objects through intuitive GUIs, and easily view dependency information for an object. Advanced features are available to users with Trial or Commercial licenses. 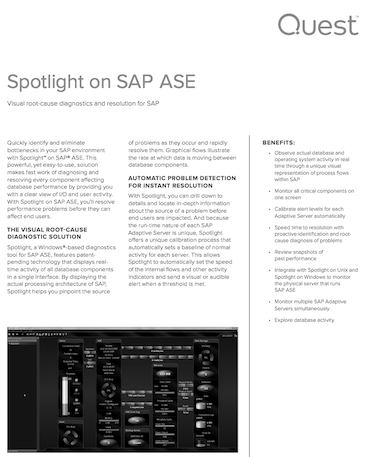 Rapidly find the root cause of system, database or application performance issues and make necessary corrections with our Spotlight on SAP ASE component. 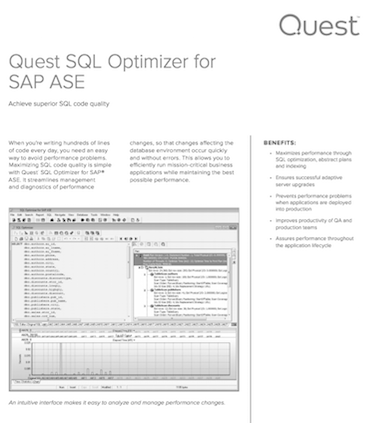 Tune application performance with automated SQL scanning, optimization and index impact analysis. Mitigate the risk of making changes by seeing which objects will be impacted by this action. Share Toad artifacts through Toad Intelligence Central for improved collaboration with colleagues. Access and manage all your Toad files using Toad’s intuitive new library feature. Track any SQL executed during your Toad session. Save time by eliminating the need to retype commonly used SQL. Process scripts and code snippets against multiple servers and instances. Roll back transactions in the transaction log without restoring from a backup. Build and execute security-related scripts against multiple servers to create, manage and replicate security for all users. 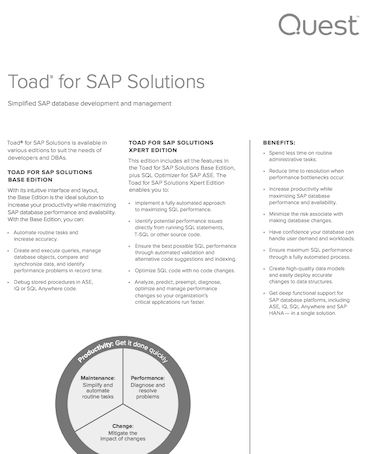 Toad for SAP Solutions’s video library includes helpful how-tos and product information to help you get the most out of Toad for SAP Solutions. The Toad World Blog is your access point to expert advice about all Toad products. The Toad World Forums is your place to ask and find answers to questions, and discuss Toad for SAP Solutions with other users, whether you're a new customer or an existing one. Learn more about our human-centered design process, sign up to participate in our research studies, and get early looks at products-in-progress.